It seems after collecting all of the Infinity Stones, Thanos just wants to kick back with some Fortnite. Avengers: Infinity War is currently the biggest smash hit of the film world. Fortnite is basically the most popular video game on the planet. Now the two are smashing together for an epic crossover that’s actually pretty feasible for a story where the villain can alter reality. We’re not kidding: In this honest-to-goodness Fortnite crossover, players will have the opportunity to play as the Mad Titan from the latest Avengers film. As reported by Entertainment Weekly, the new “Infinity Gauntlet Limited Time Mashup” mode starts out like a standard Battle Royale match. The only difference is that somewhere in the map is the all-powerful Infinity Gauntlet. The player who equips it will immediately turn into Thanos, wielding the incredible power seen on film. Apparently the idea for this crossover came from Infinity War directors Joe and Anthony Russo themselves. “Over the past few months, while we were editing Infinity War, we’d take breaks to hop on and get in a few games,” Joe Russo told EW. 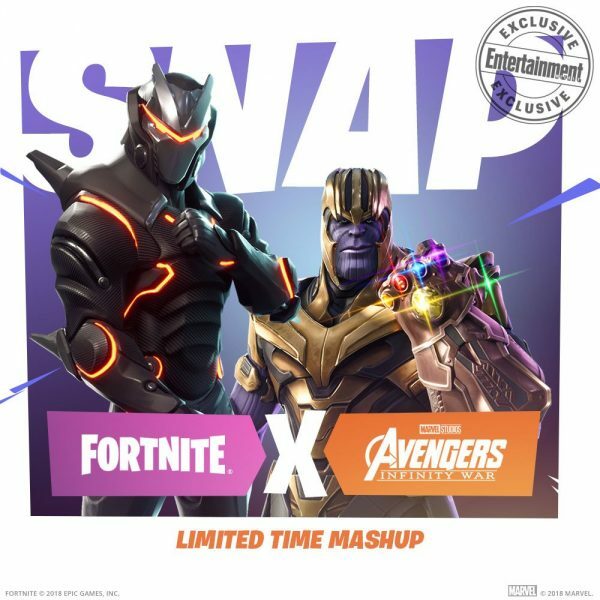 “And then we started thinking, how cool would it be to have some kind of Avengers–Fortnite mashup? So we stalked [Epic Games creative director Donald Mustard].” Naturally, Mustard agreed this would be an excellent idea. The Infinity Gauntlet mode will be available for free across all Fortnite Battle Royale platforms – specifically for PC, PS4, Xbox One, and iOS. Excelsior!